Time to sell your Palm Beach Club condo? Read about today's resort-market buyer. 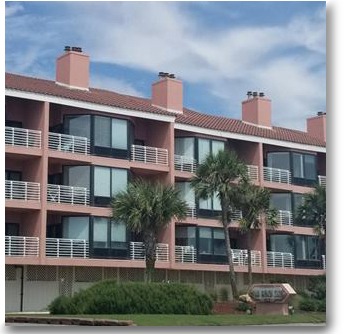 Nestled between the Santa Rosa Sound and emerald-green waters of the Gulf of Mexico, the condos at Palm Beach Club are ideally located in a quiet area of Pensacola Beach. Eighty-four units are spread out in four different buildings. These 2-3 bedroom units all boast cozy private balconies, oversized windows looking over the water, and whirlpool tubs in every master bathroom. The complex sits just outside of the entrance to Fort Pickens National Park, with a wealth of historical and natural sites to see. The gated community also sits near a trolley site, making transportation around Pensacola Beach hassle-free. The outdoor pool looks over the Santa Rosa Sound and boasts a spacious sundeck with plenty of room for the whole family to stretch out. If you feel like heading to the beach, you can either walk straight out your door and arrive at the Sound or cross the street and enjoy the sugar-white sand beaches of the Gulf of Mexico. Pensacola Beach is widely known for its natural, scenic beauty which is best enjoyed along the protected, undeveloped beaches of Gulf Islands National Seashore. Enjoy the breathtaking beauty of the area from your bike or on a drive through the park. Get out and hunt for seashells, spot the wildlife, or enjoy a quiet picnic on one of the most beautiful beaches along the Gulf Coast. Head over to Fort Pickens and immerse yourself in the history of the site, which was established in the early 19th century to protect Pensacola Harbor. When it’s time to hunt up some grub, head over to the Pensacola Beach Boardwalk. Home to some of the best restaurants in the area with gorgeous views of the Sound. Grab some fresh seafood at the Jubilee Oyster Bar & Grille before hitting Bamboo Willie’s Beachside Bar for some cold drinks. For a truly unique adventure, head over to Key Sailing on the Boardwalk to arrange a dolphin cruise, go parasailing, or rent a kayak and paddle around the Sound. Whether you’re enjoying the natural beauty of Gulf Islands National Seashore, relaxing on the pristine white sands by the Gulf, or just hanging out around the pool, the relaxed atmosphere of Palm Beach Club is the perfect place to end an exciting day at Pensacola Beach. Please let us know if you would like further information for Palm Beach Club or any other condos, homes, or real estate along the Gulf Coast or would like to schedule a private viewing by emailing info@condoinvestment.com.